Histological techniques 4. Sectioning. Cryotome. Atlas of plant and animal histology. Freezing is a way to get samples hardened without embedding. It has several advantages. a) Better molecular preservation, which is good for techniques requiring molecular detection. b) Frozen samples can be sectioned in thin sections (5 to 15 µm), but also in thicker sections of about hundreds of µm, and in thinner sections of about nm (ultrathin sections). 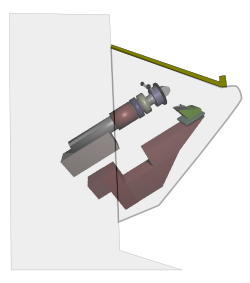 Vibratome is able to cut thick sections without embedding, but not thin sections. c) Good quality sections can be obtained from a wide variety of tissues, excepting the mineralized tissues like bone, or highly keratynized tissues like horns. d) It may be the faster way of getting sections because unfixed material can be cut, such as biopsies. Just freeze and cut. After fixation, samples are immersed in an anti-freezing solution containing sucrose and glycerol. It prevents the formation of large water crystal that may damage cellular structures during freezing. Crystal formation in also prevented by a very fast freezing. Isopentane combined with liquid nitrogen is commonly used as a freezing agent. Both anti-freezing solutions and fast freezing may preserve the cellular structure so well that it can be oserved at electron microscpy. Samples intended for light microscopy studies can be freezed at higher temperatures (about -80 oC and -20 oC). However, cryoprotecting solutions are always needed. 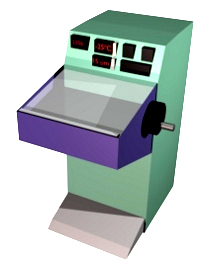 The two most used apparatuses for cutting frozen samples are the freezing microtome (Figure 1) and the cryostate (Figures 2 and 3). Thick sections (dozens of µm in thickness) are obtained with the freezing microtome. It consists of a platform where the sample is placed. The platform is raised after each section a distance that correspond with the selected thickness. In old freezing microtomes, both the platform and the sample were frozen at the same time by using carbonic gas, which had to be applied regularly to keep the temperature of the sample low. The current freezing microtomes have a tube connecting an external cooling device with the platform. The tube contains a liquid that transfer the low temperature (about -20 ºC to -40 ºC) to the platform. It is also possible to cool the blade at the same temperature as the sample. The sample is frozen by physical contact with the cooled platform and the temperature is almost constant during the sectioning period. Sections are collected from the blade with a little brush and transferred to the working buffer. They are free floating sections. Figure 1. Freezing microtome. The black tube on the right is in charge of freezing the holder at temperatures below -20 ºC, which in turn freezes the sample (in red). Section are collected from the blade with a delicate brush and transferred to the working buffer as free-floating sections. Figure 2. Cryostate. The blue compartment is the refrigerated chamber at a selected temperature. The sample and the blade are in this chamber. All the sectioning is therefore at low temperature. Figure 3. Cryiostate. The device for cuting is in the freezing chamber. Crysotate is used for obtaining 10 to 30 µm thick sections. All the sectioning process happens in a freezing chamber at -20 to -30 ºC. The freezing of the sample is usually done in a cooler platform (about -50 ºC) located inside the chamber. Sample can be frozen by other means like liquid nitrogen, but it is recommendable let the sample balances its temperature with the temperature of the chamber to get homogeneous good quality sections. Before freezing, sample is immersed in a viscous liquid at room temperature that is solid at the lower temperature of the chamber. The sample is surrounded, but not infiltrated, by this liquid, so that we have a solid block with the sample inside. In this way, manipulation of the sample and get it fixed to a holder is easier. The holder is placed in a device that gets closer to the blade after each section is obtained. 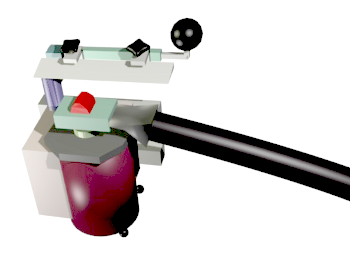 The mechinsm is similar to that described for paraffin rotational microtome. Sections are first released upon the blade and then are adhered to a slide by physical contact (Figure 4). Slides have been previously treated to have adhesive surface. Sections melt when they are contacted by the slide because slides come at room temperature. The sections are then left to dry at room temperature or in the refrigerator. Once they are dry, histological staining or processing can starts. There is a more sophisticated microtome called ultracryotome. It is able to cut ultrathin sections (dozens of nm in thickness) to be observed with the transmission electron microscopy. In this way, it is possible to study the ultrastructural features of tissues without embedding, and hence the molecular preservation is higher.